More than four billion tons of crude oil are produced every year. Electricity from wind, solar and hydropower plants cannot entirely supplant fossil sources of energy. At best, renewables could cover the energy needed to power all electric cars and to generate hydrogen for fuel cell vehicles. Even then, gasoline would still be required to power combustion engines, which will be operating for decades to come. The only sustainable way to keep us mobile is to replace this gasoline with alternative fuels. Scientists at the Fraunhofer Institute for Microengineering and Microsystems IMM, working together with twelve research groups from seven countries in the EU project BIOGO, have developed a technique to produce just such an eco-friendly biofuel. The novel fuel's ingredients come from forests: "Wood waste and tree bark are available in great quantities throughout Europe but, up to now, have all been ignored as a resource. That makes them an ideal raw material, as they don't need to be specially cultivated and thus won't compete with food production," explains Prof. Gunther Kolb from Fraunhofer IMM, who coordinated the EU project. What's more, using wood waste is climate-neutral, since converting it into fuel for combustion only releases carbon dioxide that the trees previously extracted from the atmosphere as they grew. In other words, no additional greenhouse gases are released into the atmosphere. On top of that, the fuel can be generated from wood waste wherever trees grow. Unlike petroleum, it doesn't need to be transported first from the source to refineries and then on to filling stations. "An important component of the BIOGO concept is decentralized production," says Kolb. "To achieve this, we have developed mobile production units that can be housed in containers and installed where they are needed." A prototype novel biofuel plant stands in the courtyard behind the Fraunhofer Institute. Waste products from the wood industry are transformed in the white container into high-quality gasoline. "The goal of the BIOGO project was to develop a plant that could fit in a 40-foot container with standard dimensions of 12 x 3 x 3 meters, and that could accommodate all the procedural and processing steps," is how Kolb explains the result of four years of intensive research and development. "At the same time, we had to make the manufacturing process as environmentally-friendly and resource-efficient as possible. In a first process stage, developed by the Italian company Spike Renewables, the wood waste is heated to form a dark, viscous pyrolysis oil. This can be further processed in the mobile plant. 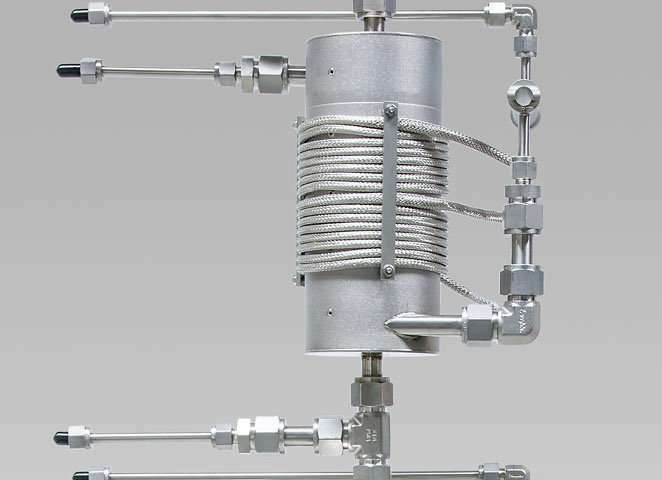 The reaction chambers for this purpose, called microreactors, have been developed by researchers at the Fraunhofer Institute in Mainz. The first reactor converts the pyrolysis oil into synthesis gas by adding heat, air, and steam. This gas is used to produce methanol in the second step. Extracting the oxygen from this, results in synthetic gasoline. "The challenge was to optimize the process so we would end up with a fuel that is chemically indistinguishable from standard gasoline," says Kolb. Catalysts are needed to accelerate the chemical reactions. Until now, large quantities of precious metals and rare earth elements were required to produce such catalysts. In the BIOGO project, scientists at Teer Coatings developed a method to apply tiny clusters of catalytically active substances to surfaces. This produces high-performance nanocatalysts that conserve resources. The final step needed to develop the mobile production plant was to integrate the entire technology into a container capable of meeting all safety and fire protection requirements. Fraunhofer researchers along with Microinnova, an Austrian partner in the project, provided the engineering expertise for the plants. The EcoTrainer@ container technology was developed by the company Evonik. The prototype was designed to accommodate even larger reactors. In the coming years, the BIOGO teams are planning to further develop the plant, with the goal of producing as much as 1000 liters of eco-fuel per day. Are we likely to see gasoline disappearing from filling stations and being sold in the woods alongside containers? "That will depend on the political circumstances," says Kolb. "As long as the price of oil remains at its present level, the new technology won't be able to compete. The key question will be whether we in Europe really want to move away from fossil raw materials and are prepared to exempt eco-fuels from taxation or subsidize their production." Thanks to BIOGO, the expertise to produce sustainable fuel exists. Since the wood-based fuel has the same chemical properties as standard gasoline, the novel raw material can either be blended into gasoline or gradually replace it altogether. 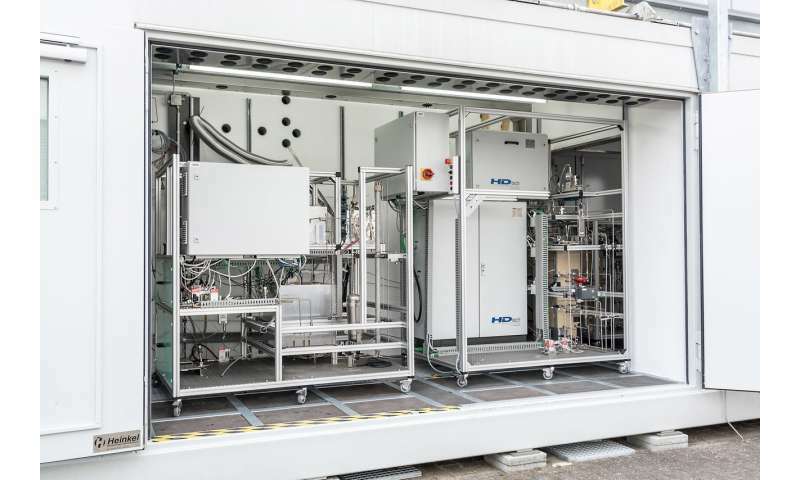 In the meantime, the Mainz research team is also hoping to use the decentralized and flexible containers for other applications: The chemical and petrochemical industries, for example, have shown great interest in the mini-factory concept. Chemical companies could utilize containers to make their processes more flexible and to react more quickly to their customers' needs. The catch: the Fischer-Tropps process used to pyrolytically convert the wood is about 50% efficient, and the process requires great energy inputs. In other words, most of the biomass is lost in conversion, and the process makes sense only if you can use the waste heat. UPM uses it for process heat in paper mills, so the biodiesel is actually a byproduct of paper manufacturing. As a stand-alone processing unit, turning wood waste into fuels by Fischer-Tropps is a terrible waste. It's more valuable as a heating fuel for households, where it would displace gas and oil directly 1:1 for its full energy value, either directly or through CHP plants in district heating.